Q1 QUALITY SYSTEM REQUIRED: If required by M&R Engineering's customer, the supplier shall establish and maintain an effective Quality System in compliance with the requirements of ISO 9001, AS9100, NADCAP, etc. As part of the Quality System, supplier must ensure that their personnel is aware of their contribution to product conformity, product safety, and the importance of ethical behavior. The supplier's Quality System is subject to On-Site or Off-Site audit, verification, approval and/or disapproval by M&R Engineering's representatives. Q2 MRB AUTHORITY: Material review board authority is not authorized by this purchase order. Q3 APPROVAL & CHANGES: The supplier is not authorized to approve changes in product or process on this purchase order. Q4 RAW MATERIALS & SPECIAL PROCESSES: Raw materials used in this purchase order shall be accompanied with original mill certifications, chemical and/or physical test results. Raw Material and Special Processing supplier shall certify the specific requirements (ie: AMS Spec) defined on the purchase order. Unless otherwise specified on the Purchase Order, material/process shall be compliant to the latest specification revision. Q5 LOT CONTROL/TRACEABILITY: Where, and to the extent that, traceability is a specific requirement, the supplier shall apply a unique identification to the individual product, material or batch (ie: Lot #, Date code) per PO requirements. This identification data shall be recorded and traceable to related suppliers records. Q6 SUPPLIER QUALITY RECORDS: The supplier shall maintain suitable records (inspection reports, test reports, material certifications, PO requirements, etc) to serve as evidence of conformance with specified requirements. Such records shall be legible and traceable to the product involved. These records shall be maintained for a minimum of ten (10) years from the date of the final manufacture or as stated otherwise in the PO. Q7 SUBMISSION OF NONCONFORMING PRODUCT: Nonconforming product returned to the supplier by M&R Engineering, and subsequently resubmitted to M&R Engineering shall bear adequate identification of such nonconformance. Identification may be listed on the previously non-conforming articles, materials, or applicable supplier's records. The supplier shall provide evidence that the root cause of the nonconformance was corrected and that actions were taken to prevent recurrence. Q8 SUPPLIER NOTIFICATION OF NONCONFORMING PRODUCT DELIVERED: When the supplier has determined that nonconforming product(s) have been delivered to M&R Engineering, the supplier shall notify the buyer within twenty-four (24) hours of the initial discovery. The supplier shall use receipt acknowledgment e-mail or other positive notification method. The notification shall include the supplier name, M&R Engineering's PO number, part number and description, affected quantity and serial numbers (if applicable), packing slip numbers and a brief description of the nonconforming condition. Q9 ACCESS TO SUPPLIER'S FACILITIES: During contract performance, the supplier shall grant reasonable access to their facilities to the representatives of M&R Engineering, M&R Engineering's customers, US government, regulatory agencies for the purpose of evaluating supplier's conformance to all PO/Contract requirements. When applicable, the access requirement shall be flowed down by the supplier to the supplier's sub-tier sources. Q10 FIRST ARTICLE INSPECTION REPORT: When specified on the purchase order, Supplier shall perform a First Article Inspection on all new product, drawing revision changes, or process changes and forward one (1) copy of the First Article Inspection Report to the M&R Engineering buyer. 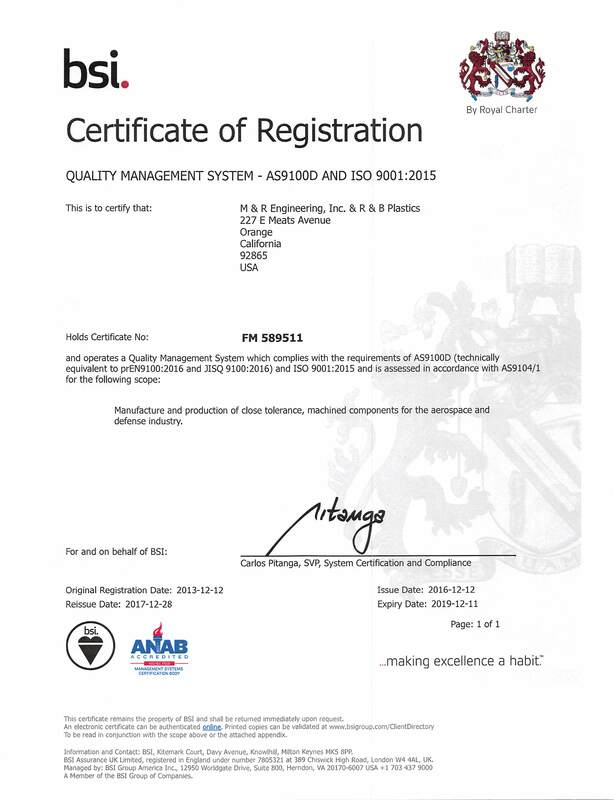 Q11 CERTIFICATE OF CONFORMANCE: Included with each shipment to M&R Engineering shall be a Certificate of Conformance signed by the supplier's Quality Representative indicating as a minimum of the process description, process number, name and address of the supplier, the purchase order, part number and part revision. Q12 MATERIAL TRACEABILITY: The material used on this Purchase Order must be positively identified to maintain traceability to original manufacturer's Heat Lot or Batch number according to original mill certifications and/or test results. Traceability must be maintained throughout the manufacturing process and completed product. Q13 CONTROL OF SUB-TIER SOURCES: The supplier is responsible for meeting all PO/Contract specified technical and quality requirements, whether the supplier performs the work or it is performed by the supplier's sub-tier sources. When the supplier uses sub-tier sources to perform work on products and/or services scheduled for delivery to M&R Engineering, the supplier shall flow down to sub-tier sources all of the applicable technical and quality requirements of the original M&R Engineering PO/Contract. Q14 REQUIREMENTS FOR QUALIFICATION OF PERSONNEL: Where applicable, only qualified/certified personnel shall be used based on process specification requirements (NDT, etc). Records shall be maintained of the personnel qualifications/certifications. Q15 DELEGATED AUTHORITY OF INSPECTION FOR RAW MATERIAL: Where applicable, M&R Engineering authorizes and requires the supplier to perform receiving inspection on all raw material purchased by M&R Engineering and delivered by another supplier. Original shipping and certification documents must be included with shipments made by the supplier. Q16 COUNTERFEIT PARTS AND MATERIALS: The supplier shall verify the procurement source and associated certifying paperwork. Appropriate incoming inspection test methods shall be used to detect potential counterfeit parts and materials. The supplier shall flow this requirement down to all sub-tier suppliers to prevent the inadvertent use of counterfeit parts and materials. Q17 INTERNATIONAL TRAFFIC IN ARMS REGULATIONS (ITAR): The technical data and components herein provided may be subject to export control under the International Traffic in Arms Regulations (ITAR) or the Export Administration Regulations (EAR) and will be indicated as ITAR controlled. The technical data and components may not be disclosed to any foreign persons or foreign commercial entities, including employees, vendors, suppliers, subcontractors, and consultants. The technical data will be used for the manufacture or processing of the articles required by the purchase order. The supplier will convey the same requirement to its sub-tier suppliers. The supplier also agrees to destroy or return all technical data upon completion of the purchase order.